Cut one 18" square each of fabric A and fabric B. Cut one 18" square of polyester batting. Cut one 45" x 72" square each of fabric A and fabric B. Cut one 45" x 72" square of polyester batting. Fuzzy Fleece instructions are at the end. 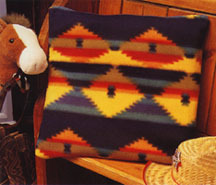 With right sides together pin fabric A and fabric B pillow square together having raw edges even. Pin batting to wrong side of fabric B, having raw edges even (Fig.1a). Stitch together in 1/2" seam, leaving on 8" opening in the center of one edge to turn; backstitch at opening to reinforce. Trim corners (Fig. 1b). Turn pocket right side out; press lightly. Turn under 1/2" on opening edges; slipstitch opening closed (Fig. 1c). With right sides together pin fabric A and fabric B quilt sections to together having raw edges even. Pin batting to wrong side of fabric B, having raw edges even. Stitch together in 1/2" seam, leaving a 12" opening in one long edge to turn; back stitch at opening to reinforce then trim corners. (Fig. 2a). Turn quilt right sides out; press lightly. Turn under 1/2" on opening edges; slipstitch opening closed. Mark the center one edge of pocket and one short end of quilt. Place pocket on quilt matching center markings, having fabric B facing up for both quilt and pocket. Machine-stitch 1/4" from edge of pocket, leaving inner most edge open; backstitch at inner corners to reinforce (Fig. 3a). To make quilting lines, mark two straight lines on quilt starting from outer edge of pocket to opposite end of quilt. Use your favorite method to mark lines, such as pins, fabric marking pencils or chalk. Keeping all thickness of quilt smooth, machine or hand-stitch along marked lines. If you prefer to feature the design of your fabric you may stitch along desired lines or designs of fabric pint or use embroidery floss to time small knots thorough all thickness, evenly spaced apart (Fig. 4a). One piece of polyester batting 45" x 72"
Mark the center of one edge of pocket and one short end of quilt. Place pocket on quilt matching center markings. Blanket stitch outer edges of quilt and pocket leaving inner most edge of pocket open. On a flat surface, place quilt with pocket side down. Fold quilt into thirds, overlapping long edges (Fig a). Turn pocket over end of quilt. (Fig b). Fold remaining end of quilt into thirds (Fig c) and continue bolding into the pocket, forming pillow (Fig d).